- a memoir of Shuntaro Hida M.D. Click for a special peace video. The "Bell of Peace" model was sent as a gift by the Mayor of Nagasaki to the City of Richland, Washington, on the 40th anniversary of the atomic bombing. Richland is the home of the Hanford Nuclear Site, where the plutonium for the Nagasaki atomic bomb was produced. 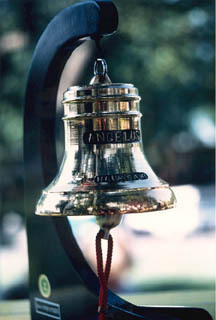 The original Bell, a symbol of peace in Nagasaki, was recovered near ground zero from the ruins of Urakami Cathedral and rung everyday to console the survivors of the atomic bombing. Richland's "Bell of Peace" model is rung every August 9 at the Atomic Cities Peace Memorial ceremony. In accordance with the Memorial's theme of reconciliation, the "Bell of Peace" is rung for those who died on both sides of the war  for the Americans who died at Pearl Harbor as well as for the Japanese who died in Nagasaki. LISTEN to an interview about Richland's "Bell of Peace" on Northwest Public Radio, August 8, 2005. Welcome to the World Citizens for Peace website. We appreciate your taking a few minutes to stop by and we invite you to stay as long as you wish while exploring the available resources. World Citizens for Peace is dedicated to the abolition of nuclear weapons and war. It is the only peace and nuclear disarmament organization at the Hanford Nuclear Site, where plutonium was produced for the Trinity test, the Nagasaki atomic bomb, and two-thirds of the U.S. nuclear arsenal. WCPeace considers the existence of nuclear weapons the greatest threat to all life on earth. We work for the abolition of nuclear weapons, reduction of militarism and the global trade in conventional weapons, and peaceful resolution of conflicts at all levels of society. WCPeace does not deal with the issues of nuclear power, nuclear waste or the environmental, health and safety aspects of the military and civilian nuclear industries. See "Goals" and "Activities" for more information. In spite of our globally-oriented name, World Citizens for Peace is a local organization. It was founded in 1982 by residents of the Tri-Cities (Richland, Kennewick, Pasco), Washington, as part of the Nuclear Weapons Freeze Campaign. [Founding Statement] The name of the organization reflects the need for individual and collective allegiance to the principles of peace and nonviolence throughout the world. The independent, all-volunteer organization [Officers] is nonpartisan and nonprofit. If you are interested in joining us as a member or in supporting our work for peace in the Hanford community with a donation, see "Join us". "Our country is the world, our countrymen are all mankind."